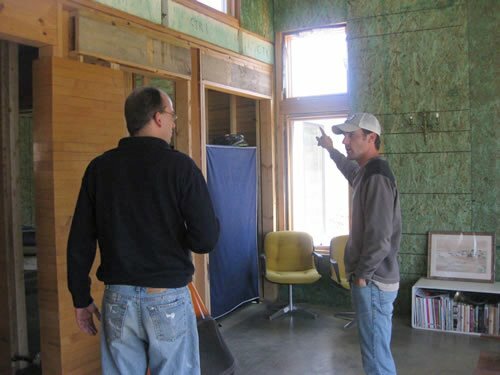 Prefab Net Zero Off Grid SIPs House Kit - Getting Ready For The Open House! 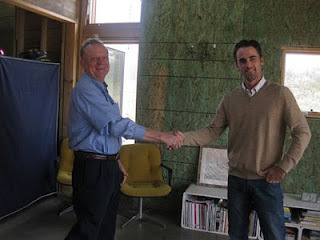 We had an off grid net zero prefab systems meeting with our new contractor, Jason Dorris. You may recall that our Fabulous Contractor, Ron Bernaldo, has up and retired on us to spend more time with his grandchildren. But don't you think fer a second Ron is not looking over all of our shoulders!!!! Fortunately, he, and we, have faith in Jason, who, with his architect wife, are in the area awhile, having just moved back to the mainland from Hawaii. 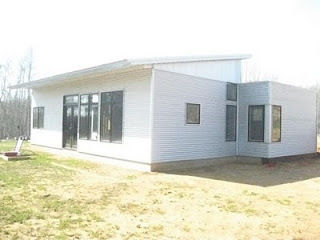 I won't go into too much detail on the off grid systems for the prefab house today, because this is going to be a big part of Handsome Husband's talk at the Net Zero Off Grid Prefab Green Home Open House, coming up April 10th. It is very exciting to finally get to the net zero systems point. If we can install everything this summer, we will be able to be out on the land, comfortable, in the dead of winter for years to come. I busied myself tidying up for the Off Grid Prefab Open House -next weekend is Easter, so this will be the last opportunity to do anything before then. So I made the beds with the "when this house is done and the dogs can't rip and muddy these sheets" sheets I have been saving, because now the bedrooms have doors which means I can keep out the dogs! I had intended to wash the concrete floor really well, but because the day was cold and I am sick it did not happen. 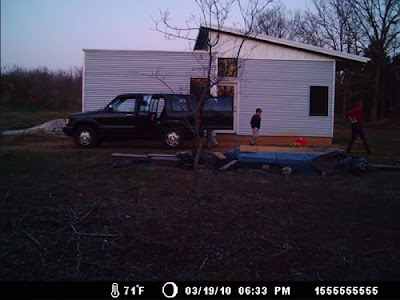 Besides, Jason will be doing work in the house next week... continuing where our Mennonite Minister and Fabulous Carpenter Bobby Hirsh left off before heading with his family back to Haiti to help the people and build emergency shelters there. So, instead, let's focus on interior design a bit. The 7 year old's bedroom will have a Black Forest theme, with my grandmother's bed (still trying to get a mattress that fits, *sigh*), old German cuckoo clocks, and (because you know I love a joke) some false notes within and surrounded by real nature. 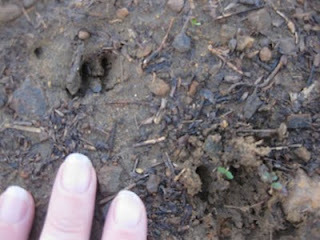 There will also be real nature surprises, within. Modern, mid-century Danish accents, yet with the chuckle of ponies and unicorns... because that's what she's all about. There will, eventually, be bunk beds. 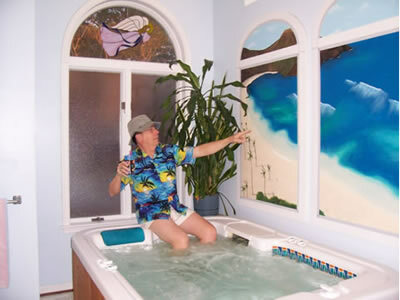 Let's talk about the bathroom. From RVA Restore we salvaged a stainless steel sink a few months back. It occurred to me we can embrace our agricultural heritage WHILE complementing the sink with a modern touch by reusing livestock troughs as a shower / tub! 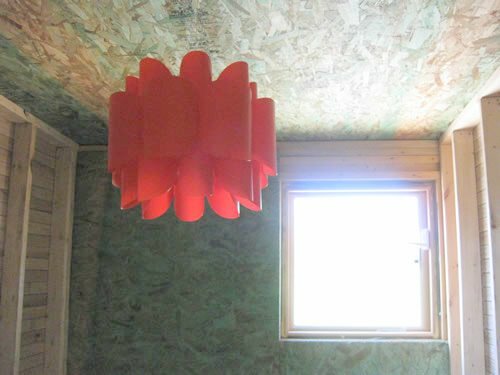 This also has a practical purpose - although we will usually use this as a shower, the reality of living in an off grid net zero prefab house where we have chosen to live more simply, with less systems, etc. is that I will need somewhere to rinse and wring out sudsy clothes, especially in the winter, after washing them with my hand washer. Unlike a tradtional tub, I can attach my hand wringer to this and it will look like they were made to be together, stylishly! 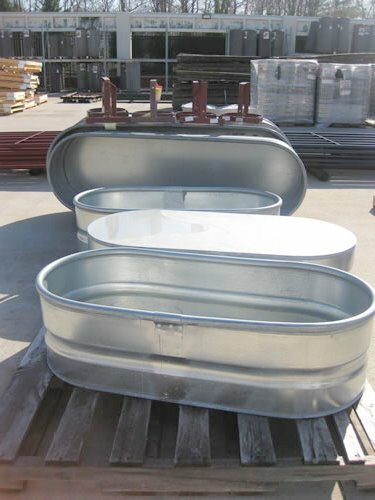 I found a galvanized round end tank, 24x12x48". I also added a lamp, to brighten up the bathroom. 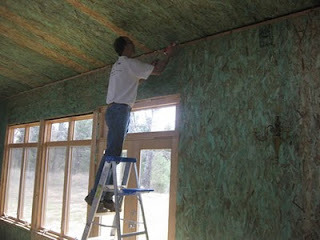 It's a bit crooked, just like everything in the prefab house kit... you are welcome to straighten 'em if you like! I envision the red, the gray touches of metal and concrete (as it is, throughout the prefab house kit), and painting the surface with ceramic paint in a warm yellow - a subtle homage to the VMI basketball court!!!! Handsome Husband got all excited when I shared my idea, and immediately said, "AND we could put the VMI logo on the wall there!!!" Picture the most interior wall of that south room, covered in historic VMI maple floorboards: from the polished concrete of the floor to the tippy top of the clerestory windows. Then, spanning the room, a clean, shining concrete floor (a girl can dream...), and, looking out to the beauty of the real world, that most south wall painted in gray, framing the colors of the seasons outside, drawing your eye to compel you to go outside, or providing strength and structure as you cozy indoors, with a book or good friends. Just as I begin to lose myself in design reverie, Handsome Husband starts carrying in bundles of floorboards. And plops them in the midst of my just-cleaned, just-tidied, just-swept room. LAST Vintage Hat Friday Of The Season! Which ruins my plan to head out to the prefab and spend a sunny, dry weekend getting ready for the Prefab Open House. See, the Prefab Open House is in two weeks. But no, it rains. Torrents. Not even a nice gentle drizzle. It's the LAST VINTAGE HAT FRIDAY of the season!!! See, once the seeds sprout in the cold frames, it's all over for the season. Now, for our work breaks, we can enjoy the garden as it stirs to life, again. So say farewell to Vintage Hat Friday for the year, and make sure you vote! Copeland: It's Raining, So I'm Reading. This dress was free. Recycled from the 70's, Amy foolishly gave it to me. For free. And now I'm using it against her. Did I mention it's raining buckets? 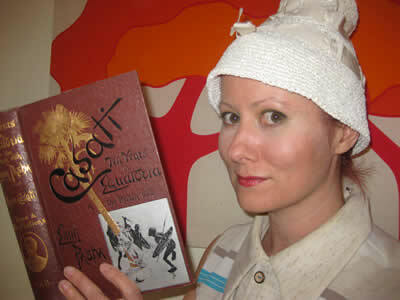 What else is there to do than curl up with a nice old book, in this case, a book about An Adventurous Casati (there's quite a few Adventurous Casatis, by the way...). The hat, I believe from a thrift store this summer, on sale. And the jacket from an estate sale... for about $2. Amy: Going out with a bang... or a rant. Or several rants. Copeland gave me several lovely vintage dresses this week (for which I am very grateful) and I had the good taste to not use one of Copeland's dresses against her *looks meaningfully at COPELAND! * Nah, she wears it well and looks about a million times cuter in it than I did. 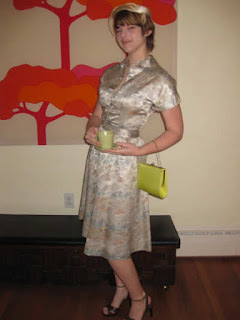 Vintage - if you're not wearing it, PASS IT ON! Thrift KARMA! The hat was... I have no idea. The tag assures me I paid $3 for it. And the brand appears to be "Randy Sue" That's all I got. But it's furry? And has a pinfeather? Neato. The purse was 50 cents at the (yes, yes I know) St. Catherines Theater sale. The shoes were a hand-me-down gift from a friend. My screw post leaf and rhinestone earrings were actually the first purchase I ever made at Halcyon when I first found it my second year in Richmond. The coffee cup? Oh, I stole that from Copeland. It's the last vintage hat Friday of the season... VOTE FOR ME! Wait... my DAD is playing? *sigh* I don't know what he's brought, but it was his birthday this week... And Copeland looks fabulous... Whatever. VOTE FOR SOMEONE! A DARK HORSE ENTERS!!!!!!!!!! It's... it's... It's AMY'S DAD!!!!!!!!!!!!!!!!!!!!! And as we start to read his entry... our jaws drop. The office stops. SIR, **ALL** The (Vintage) Hats Are OFF TO YOU!!!!" The Story: There I was, sailing for endless days on a warship in the tropics of the vast Pacific Ocean in the waning days of the Vietnam War. It was war, I tell you, war! (Wanna see my medals?) Anyway, I needed a wide brim hat to shield my pasty white skin from the harsh rays of the sun while ashore. Being a resourceful young sailor with time on my hands, I set out to craft one from the materials at hand. 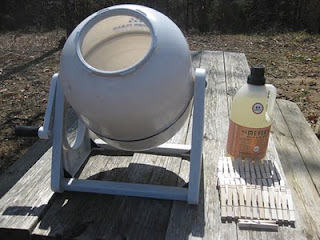 I can still almost feel the churning, foamy, deep! The Hat: (This is that site about the old hats, right?) Using the cutoff legs from a pair of boot camp issue denim pants (I needed a pair of shorts too) the hat was carefully hand crafted. Notice how the pant leg side seams are lined up across the brim, up the side, and across the top (military precision). Is that you Wilson? Look at that hand stitching on the inside! It even has a sweatband! 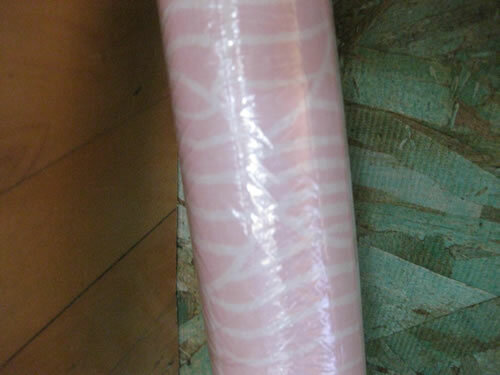 The brim was stiffened by ironing a layer of sheet polyethylene between the upper and lower portions. What a hat! It’s old! (40 yrs). It’s recycled! The Rest of the Outfit: The ever-popular Hawaiian shirt was purchased from the Walmart in downtown Honolulu. 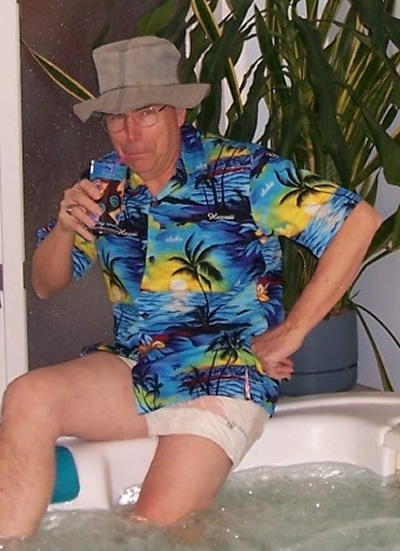 (Don’t be silly, of course there is one there) And, as strange as it may seem, Hawaiian shirts are still made in Hawaii, even the ones sold in Walmart. The classic OP (that’s Ocean Pacific to you young’uns) swim shorts are hand-me-downs from a neighbor, saved at the last minute from a trip to the thrift store. Notice the faded but classic Hawaiian print. So VOTE FOR ME, the Veteran, but not mad, hatter !!!!!! 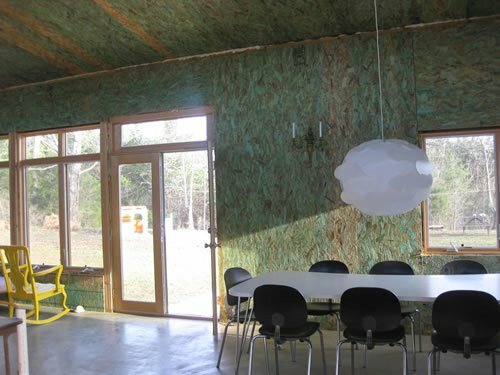 Spring Arrives In A Net Zero Prefab House Kit. 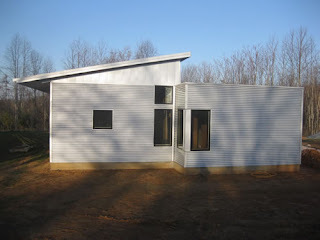 Now that the time change has occurred, the milder weather and longer days allow us to race the sunset to the off grid prefab house kit- watch with a keen eye as we pack up after work on a Friday (vs. Saturday), load up, and keep abreast with the sun along the railroad tracks and highway, quickly pacing it and our progress, hoping to unload inside the prefab house kit before the sundown. This time? It was a tie. In the harsh seasons, this is critical. 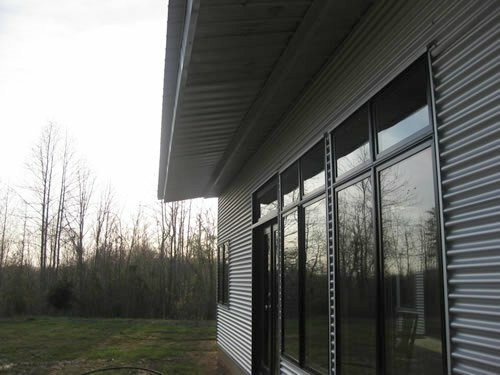 We still have no heat, only the passive solar design and the comfort of the energy efficient SIPs (structural insulated panels). 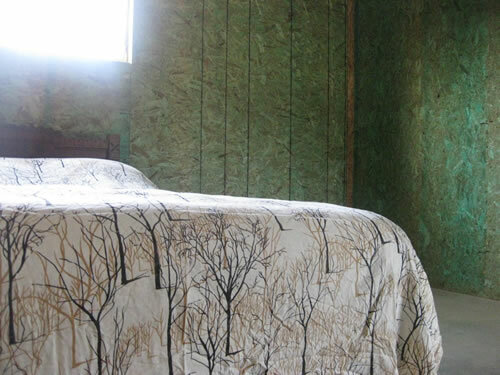 When we used to camp here in March or December in the camper, before the comfort of the passive design and SIPs of the prefab house kit, even without systems, EVERYTHING had its place and moment- if it didn't, you could not only question comfort, but survival. "Child 1, Child 2, you get XYZ. Go to the bathroom first, then WE ALL ENTER TOGETHER, once, so not to lose an iota of heat!" We did. 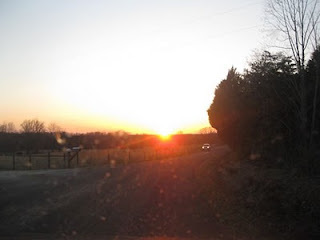 I hurried back to unload what was just needed but not carried (the rest could be unloaded in the sun's warmth tomorrow)... when suddenly: I noticed the bright green of the fields, heard the frogs on the pond... saw the deer scatter on the field... and realized, "Oh, wow, spring arrives." Even with a window cracked and the prefab house kit engulfed in the long shadows of dusk already, inside it was 68. Now we're sealed in for the evening, happy, comfortable, cozy. And wow, it will not be going down to 11 degrees tonight, just the 30s. It will be cold outside; but inside, comfortable. Thus begins the season where we don't really document temperatures, it's just too comfortable and non-interesting. Throw us in the 100 degree or 10 degree conditions, and that excites us to document! But now? 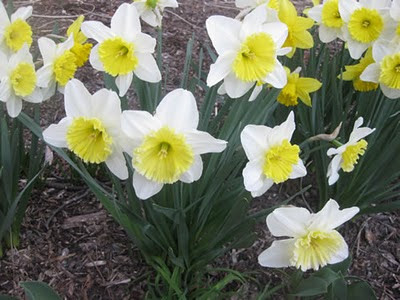 We're too busy having fun with the bulbs bursting and the trees about to flower... I'll try to post the temps but... it's hard to do when it's boringly comfortable. Tomorrow, we work on the prefab. And maybe go to a farm auction. 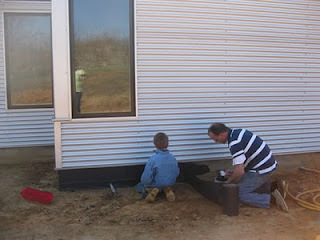 But first: the prefab house kit foundation finishing!!! We are off to pick up the interior bedroom doors and head out to a farm auction. Last night, when we closed up the house, the temperature was 64ish after the opening and closing of doors in the evening. 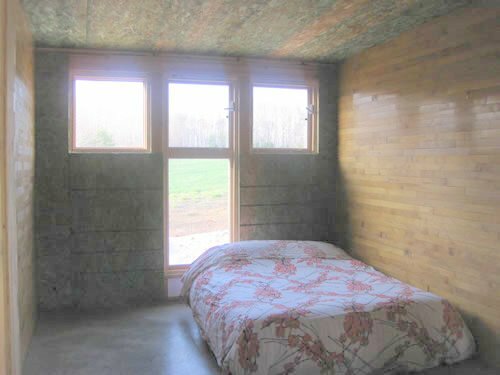 At dawn in the prefab passive solar house? 60. Outdoors, the temperature fluctuated from 78 to 34! Handsome Husband and Pipsqueak #1 spent the weekend adding the rubber membrane over half of the slab... and Ron, Our Fabulous Contractor Who Retired On Us, said it was the BEST job he's ever seen anyone do! We were admittedly thrilled. Over the rubber membrane, around the prefab house kit slab, we will add foam, then flashing to match the cladding. Handsome Husband also sealed with foam to further insulate the top of the south wall where there was framing where the wall SIPs meets the roof SIPs (structural insulated panels). We had our list of “to do”s for the weekend laid out. 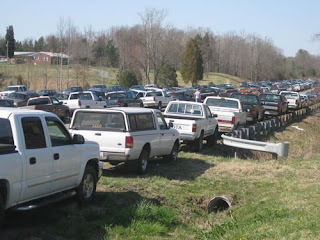 Check out how looooooooooong the line o' cars were, up and down the highway- and this photo doesn't nearly capture it! EVERYONE was there, from four states adjoining, supposedly. 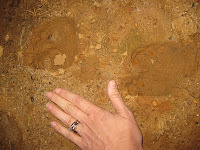 The Amish were there, thanks to drivers (no horse-and-buggies on 360)! Even a few helicopters flew in from adjoining states, for the larger equipment... which provided *much* entertainment for all. 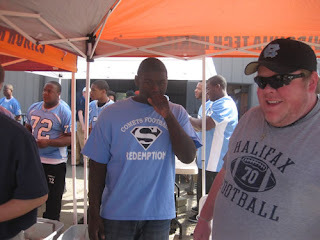 Food was provided to raise money for good, local causes - check out these sweet guys on the right, a football team and their coach, raising money for the Jaycee's. And then it was back to work. WHILE the Shop Dawgs lounged, of course. 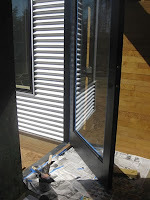 If you come to the Net Zero Off Grid Prefab Open House April 10th, please make special mention of the "gorgeous" newly painted front door (which we still need to trim in galvalume to match the window above it), but seriously, folks, isn't it the *most gorgeous* paint job you've ever seen in your life?!? I painted the door to the prefab house kit finally. Fiiiiiiiiiiiiine, I'm no Tom Sawyer, to my chagrin. And I have a renewed respect for anyone who paints professionally. So again I tested out my Lehman's hand washer. We had fresh clean sheets to put onto a certain someone's bed by day's end, dried in the outdoor sun and wind, without having to cart 'em back to Richmond or impose upon local friends. Handsome Husband and Pipsqueak #1 continued adding the rubber membrane about the prefab's slab, to which we will then add our insulation to ensure the prefab house kit is completely insulated not just from the prefab house kit panels in the walls and roof, but under and about the foundation. AND while we were busy working, Pipsqueak #1 taught Pipsqueak #2 how to ride a bike!!! As we finished our chores and readied the prefab house kit for departure, Ron drove up with Jason Dorris. Jason and his wife moved here from Hawaii last week. It turns out that Kristin is an architect (I took her to Green Drinks in Richmond this week), and Jason, a contractor! His parents have a farm right down from us on 47. They are staying there until they can decide where they want to move, if at all. Ron may have retired (*sob*), but he's not leaving us. Thanks to Ron & Judy, we now have someone who can help us with our prefab green home while they enjoy their grand children! P.s. 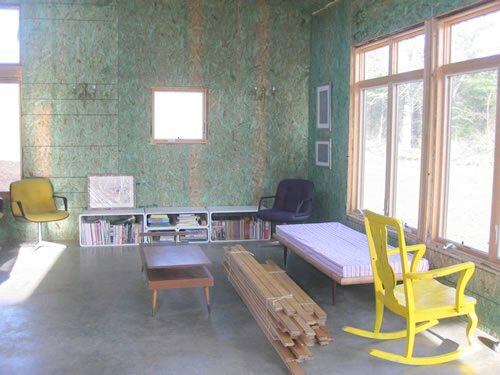 Here's some of my favorite photos from the weekend in the net zero off grid prefab house kit! 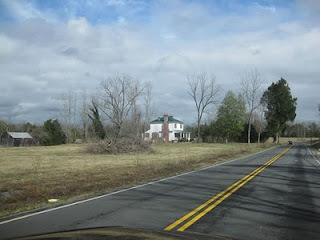 And rural structures, which, if you follow this blog, you know I love documenting. 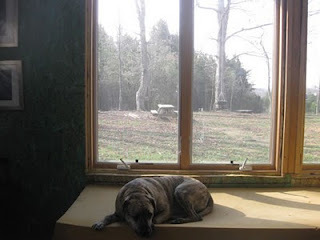 In the prefab off grid net zero pre-fabulous house kit: HAPPY. 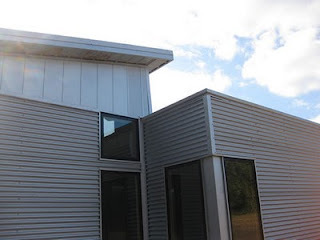 A Pre-fabulous Weekend To Visit The Passive Solar Prefab House! 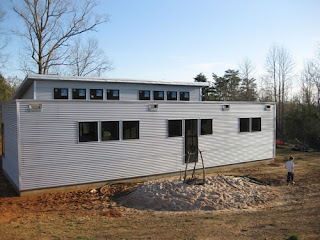 I am running off to meetings, but not before I quickly tell you that SPRING IS HERE, the weather in Virginia is GORGEOUS, and with the days lengthening we will be heading out to the net zero passive solar prefab house kit after work tonight instead of waiting until Saturday. 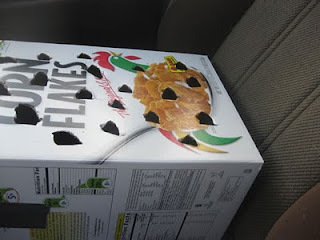 We do this often during longer seasons: pack up the car at lunch time, and as soon as our work day ends spend the first hour of the weekend eating sandwiches in the car for dinner as we drive to the land. 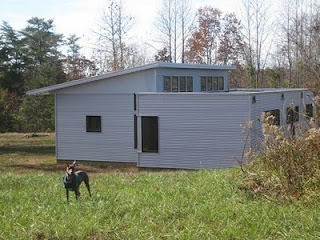 Usually, we pull up and unload, getting ready for the evening while the children and dogs frolic and run about, then call them inside just as the sun is setting... for a beautiful, relaxing weekend in the prefab house kit. 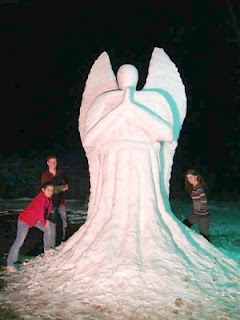 We will be doing more work around the foundation this weekend: Adhering the foam around the slab, adding flashing, etc. 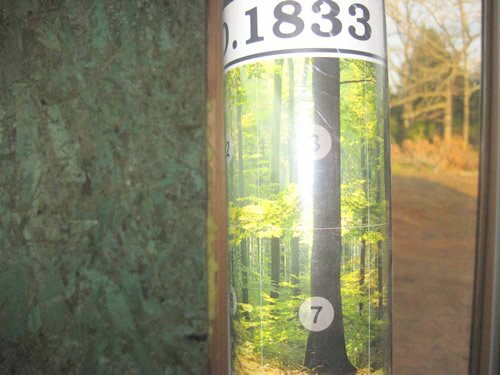 And there are more trees to plant! 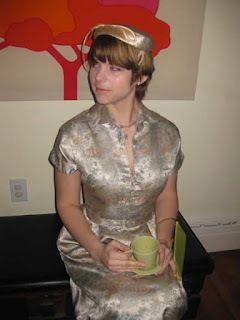 But first, before we head out to the net zero off grid prefab house kit... there is Vintage Hat Friday. 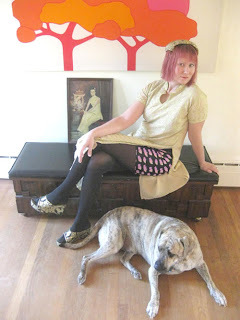 The Dress: It’s been awhile, but I *think* the dress is from (now out of business) “Nonesuch” in the fan. The shoes (behold my 1 pair of white shoes) and purse were both from Target, on clearance. The brooch is a vintage reproduction from “Bygones” in Carytown and was a birthday gift from Copeland 2 or 3 years ago. 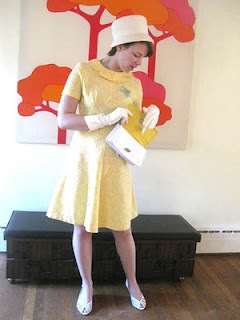 The hat and gloves were from an estate sale last year. This hat gives me trouble, as it’s hard to wear without looking ridiculous. Perched at the front of the head you start to look a bit like you’re trying to pass it off as a top hat. 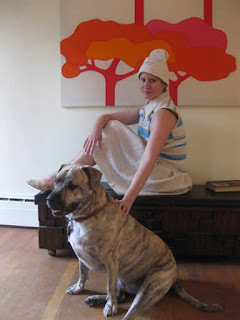 Perched at the back you can only hope to pull of Jackie O instead of ‘help, help, this hat is eating my brain!’. *for those of you unaware, Bowtie Cinema on Boulevard is playing ‘Hello Dolly!’ next week as their classic 11AM feature Saturday and Sunday. If you like musical theater, it’s a must! Featuring such fabulous lyrics as: “It takes a woman all powdered and pink, To joyously clean out the drain in the sink” See you there! Vote for one of us, and then get out and enjoy the weather! Don't think this Shanghai Suzi has completely adhered to tradition. She might be in traditional garb (bought for 99 cents, yes, 99 cents, at Fan Thrift during that hike in the snow a few weeks back), but underneath, honeychile, underneath she is SPORTING hot pants and platform heels, ready for clubbing. The hat, from the St. Catherine's theater sale, and the 1940s art, from my collection of "art I love that is not professional" or, amateur art I love to buy from different time periods. The hot pants with dead fish, yes, DEAD FISH, are an homage to our Chesapeake Bay and James River, purchased at Trash & Vaudeville some years back when I was an East Village resident of New Yawk Cit-tay. Speaking of New York - we have some news! 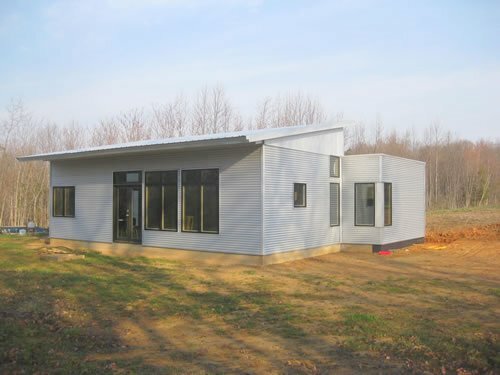 There will be a New York prefab SIPs passive solar house kit for you to see this summer!!! 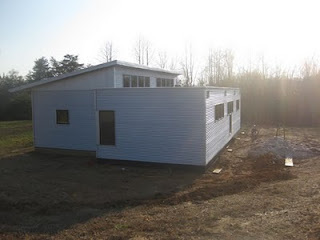 I will keep you posted on that, the Colorado project, and this as the summer progresses... as the Colorado & New York projects told me they're not really into blogging (but they will send prefab house kit project photos and updates by email). In the meantime, I hope you all have a glorious weekend and... vote for meeeeeee!!!! 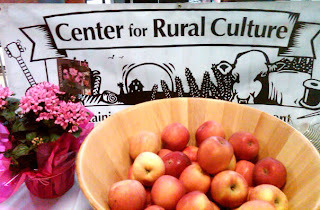 I was honored to be invited by the Center For Rural Culture to teach two classes this weekend to farmers. Oh no, not about farming, honeychile, they asked me to talk about how to connect farmers with people online like you or I so that they can continue to preserve rural heritage, landscape and local cultures while reaching out to their nearby cities and customers, online, to sell their wares so their natural, small scale farming is successful, for more generations. 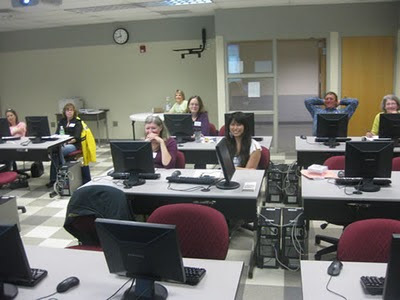 Here are some of the beautiful people in my first class!!!! In between the two classes, I had a two hour break, so what's a gal to do? UNTIL I walked out into the hallway and there, draped across a chair like the DILETTANTE he is, elegantly lounged my bad-friend-since-I-was-in-my-teens-whom-my-momma-never-liked-because-he-always-spelled-trouble, THAT boy, Tony. Completely against my will, my bad friend Tony kidnapped me and *forced* me to head out to beautiful Eden Farms to appraise some pullets. 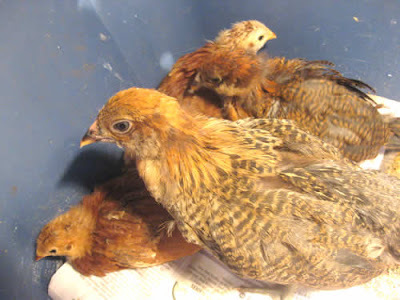 I sought my revenge when, once my four chicks were in the box, we were informed that Virginia law dictates you must buy SIX chicks... I steadily glared back... at which point Tony offered to take two and I sent him packing with a ROOSTER. Each time I come out to Goochland it is so hard, it stirs up so many fresh, not-dealt-with-yet issues... 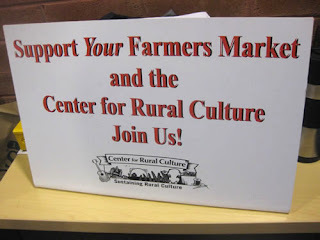 But I am coming out for a great reason, for the Center For Rural Culture, and LOVE the friends I have there and the cause I support, which is preservation of our craftsmen, our tradesmen, our farmers, our national treasure of rural culture. But you have to know: You have NO IDEA how hard it is for me to go out to Goochland. Each time I make that drive, it's losing the farm again, and heck, I've already lost it thrice. I never said goodbye, I will never go back. I remember every inch of the multi-level rooms in the old house, the double balconies, the steamboat gothic woodwork along the edges, the cannons on the front porch, the antlers in the halls, the steep kitchen staircase, the musty old wood smell of the rooms, the wild roses climbing up the columns, the EVERYTHING of the old Rotherwood that my cousins never knew. Then the fire, which destroyed the house, and the rebuilding. Then the dementia of my grandfather, and Rotherwood was lost again. Finally, divorce divided the family further. It is now divided between two of three siblings. I am happy for them. I will never go back. For kicks, I considered storming my own farm between classes. I'm grateful one of my oldest and baddest friends showed up. And you know what? I'm thinking that maybe that drive is getting easier each time I'm forced to do it. And guess what? I'm noticing all the farms I've passed by in a lifetime, are now proudly varnished with new coats of paint, new barn roofs, new fences... I am seeing good things. If Rotherwood hadn't been lost, we never would have bought The Land. 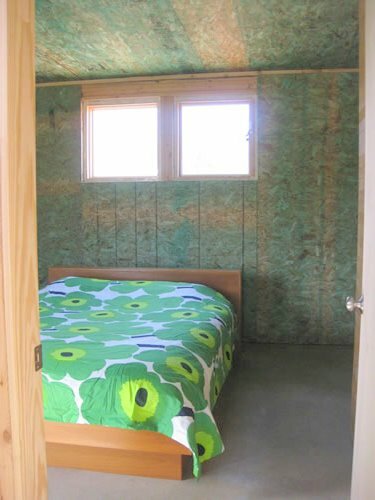 If we hadn't have bought The Land, I never would have kidnapped bazillionaire architects to found Green Modern Kits, Green Cottage Kits, Green Cabin Kits so we could have gorgeous, super energy-efficient, affordable, passive solar house kits for the rest of us. Wow. 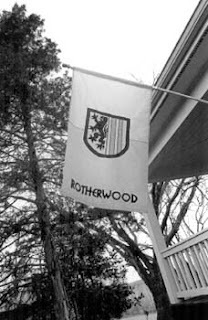 Think of it: If Rotherwood were still a family farm... none of this, any of this, would exist. 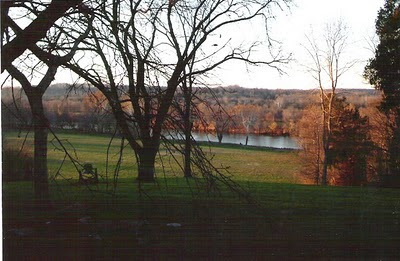 Instead, I'd be listening to the peepers emerge from winter along the pond, spending my weekends cleaning up from the winter flooding in the fields (boats tend to wrap themselves around the tops of trees down by the quarry / flood plain), reinforcing the dock, sealing the leaks in the canoes, and by now? I'd be fixing that twenty stall stable back to where it was... fixing the fences... because I'm ready for that next step for my children. One thing I have also learned in this journey: We were never part of our local community. I don't recall anyone local, just those we imported from the city, really spending time with us at Rotherwood. 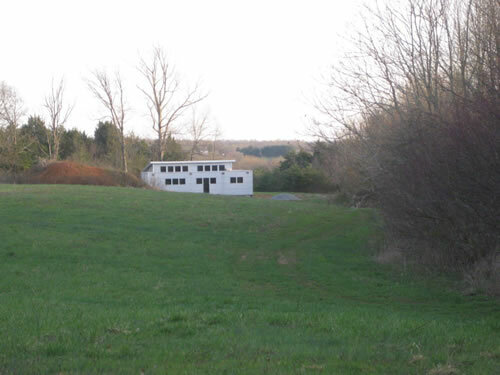 Which is starkly different from our many friends near The Land, and now, in Goochland. Back in Richmond, we eagerly loosed the chicks... and now have to keep a keen eye on our dogs. And yes, to answer your question: This does mean that for the next few weeks, when we head out for a weekend of work on the off grid net zero prefab house kit, we will not only have the car packed with tools, things to haul out there, dogs and two children buckled in but will also have a bin full o' baby chicks stashed between the car seats. Hey, look! Here we come in our car loaded up with children, dogs and chicks!!! Let's talk about Eden Farms for a moment. It's always a pleasure to see how other family businesses are created, and incorporate children. My children also love to see what other people do - in particular, the Amish children, who had a stand selling vegetables, relishes, bread, cookies... with whom my children have grown up visiting. Visiting Eden Farms was an opportunity to leap forward a few years and appreciate what these children, now in their teens and twenties, have done: they carved out fruitful gardens, started 4-H projects which turned into businesses - with rabbits, chickens, and more...and even create and sell art. If you are coming through Goochland, I would highly recommend you seek them out for coops, hutches, poultry, and more! They have a *gorgeous* garden and sell many plants as well, I know you will enjoy your visit! 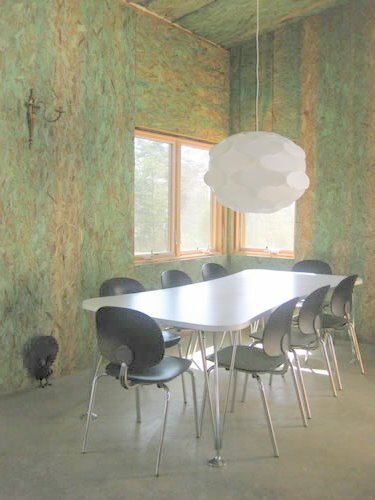 We will be busy the next weekends getting ready for the prefab green home OPEN HOUSE!